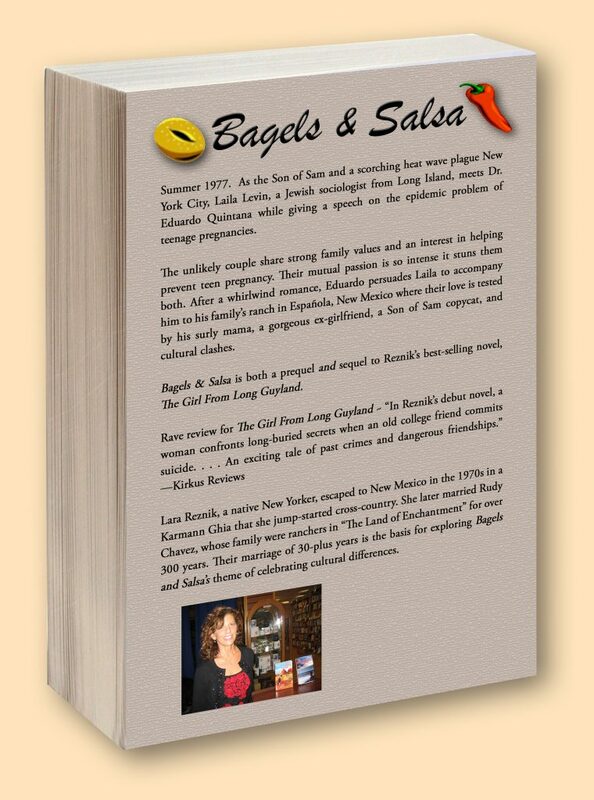 In July, 2018, my friend and fellow writer Laura Resnik-Chavez introduced me to Danielle Jaussaud, who had reached the point of wanting to publish a memoir and needed help with formatting and cover design. Although I can’t speak for Danielle, my guess is that at the time, she couldn’t have predicted a publication date any more accurately than I. For my part, the project presented a number of new challenges, with photos, endnotes, and a cover design concept I’d never encountered before, with the photo of a couple superimposed on an image of the entrance to a village in Germany. 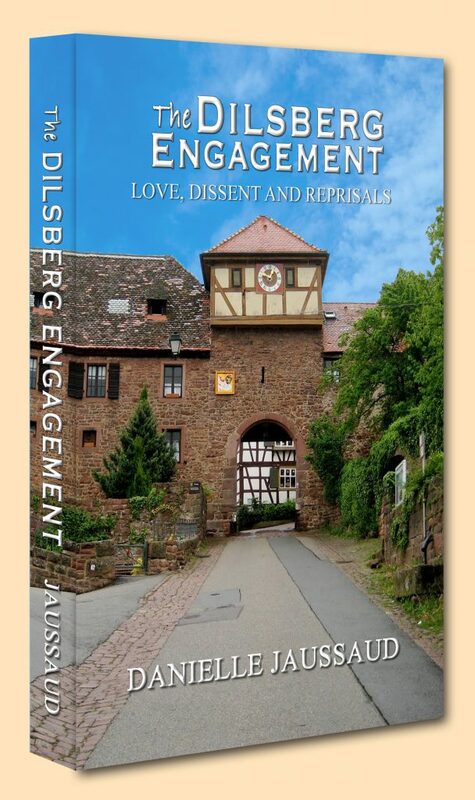 After too many trial iterations to count, Danielle elected not to include the couple, and once we had a fully edited and proofed manuscript, I began the process of uploading the interior and cover files for the print and digital editions of The Dilsberg Engagement — Love, Dissent and Reprisals. A few years ago I began working with 3-D cover images to add a little pizzazz to promotional materials. 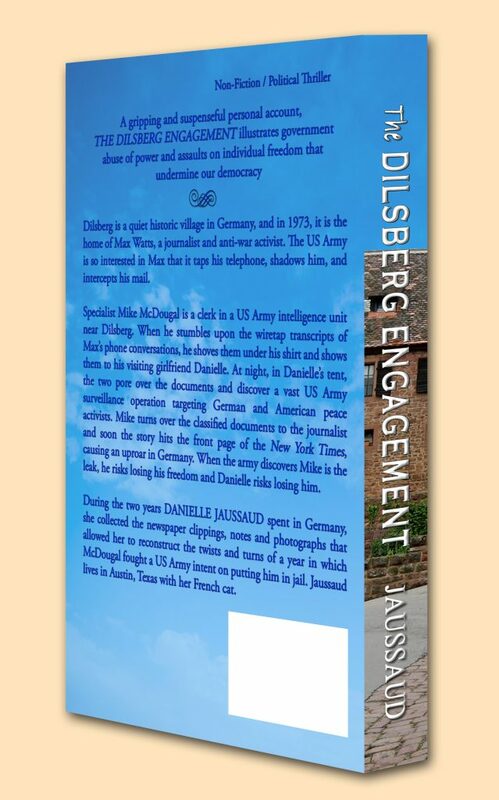 Here are front– and rear–quarter views of the paperback cover of Danielle’s book. If the title of this post is black and/or you see the fighter-pilot header, click on the title to view the featured-image header. They say you can’t tell a book by its cover; you can’t attract shoppers to your book without a good cover; and you can’t sell many without advertising. This post begins the gallery of ads I’ve designed for others over the past year or so. What follows is the review in its entirety. 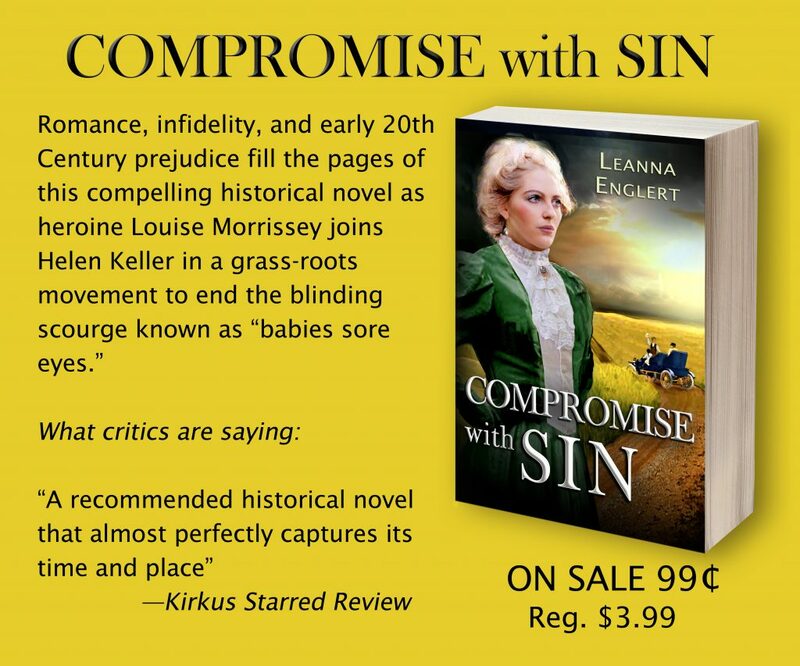 If you are familiar with Kirkus Reviews, the absence of ellipses is relatively unusual, because it means the review contained nothing the author wishes to extract so you don’t get to read it. As with most Kirkus Reviews, it starts with a short opening paragraph that provides a concise overview of the story and the genre. The second paragraph presents a synopsis that lasts until about halfway through when the meat of the review begins with, “For a story that’s . . .” From here to the end of the review, we are treated to words of the kind that any author would love to read in an independent evaluation of their novel. A Native American warrior journeys through the towns, train depots, and wilds of the early-20th-century West in this debut historical novel. 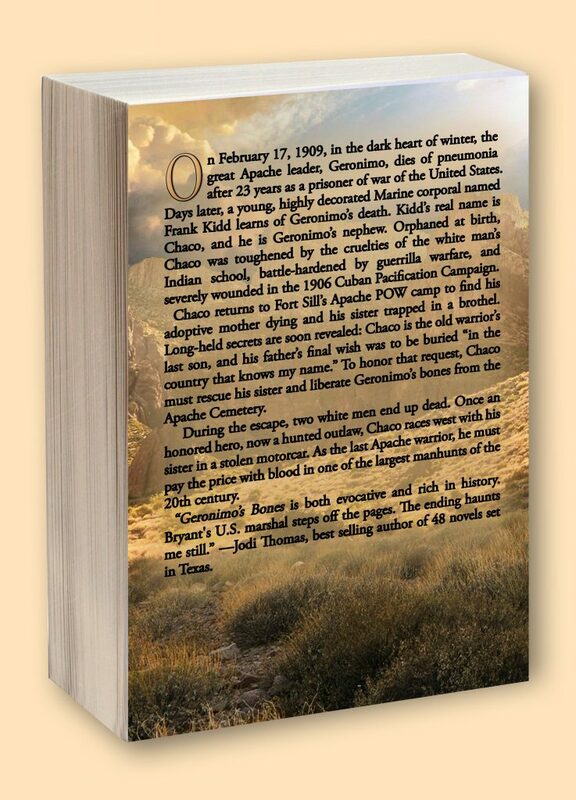 Young Chaco only knows the prisoner-of-war camp in Fort Sill, Oklahoma, where he hears stories about his people’s old ways at the knee of his uncle, the famed Apache chief Goyaa?é, known to whites as Geronimo. But Chaco is soon forcibly taken to an “Indian school” in Pennsylvania—leaving behind Goyaa?é; his adoptive mother, Aná; and his sister, Bui. He joins the Marines after he graduates, and during a stint in Cuba fighting the 1906 Pacification Campaign, he receives terrible news: Goyaa?é is dead. Shaken, he returns to Fort Sill, where he cares for his aging mother and finds out that Bui has ended up in the local whorehouse. His mother also tells him Goyaa?é is actually his father and wanted his bones to be taken to the mountains he called home. Shortly after she delivers this revelation, she dies. Chaco is filled with a steely resolve: to break Bui out of the brothel (owned by an unscrupulous proprietor named Alton McDonnell) and to bring Goyaa?é’s bones to the mountains. His quest to do so will take all of Chaco’s tactical skill and courage—and a few daring car chases and shootouts—as the resulting manhunt draws lawmen from all over the region. For a story that’s equal parts rollicking adventure and a sensitive account of a Native American’s odyssey in a particular era, Chaco is an ideal protagonist: intelligent, battle-worn, quick on his feet, and occasionally philosophical (“As he stared at the young wolf, it occurred to him that the Indian school had never been about education. It had been about domestication”). Bryant also clearly depicts the extreme racism Chaco faces, which makes his successes all the more satisfying. The book is full of historical details, deftly deployed so that they heighten the action instead of impeding it: People hop on trains, cut telegraph lines, and wrestle with high-maintenance automobiles. Add in a few colorful, nuanced characters along the way, like the cancer-stricken, former Civil War surgeon dwarf Doc Kale, and the novel shines. 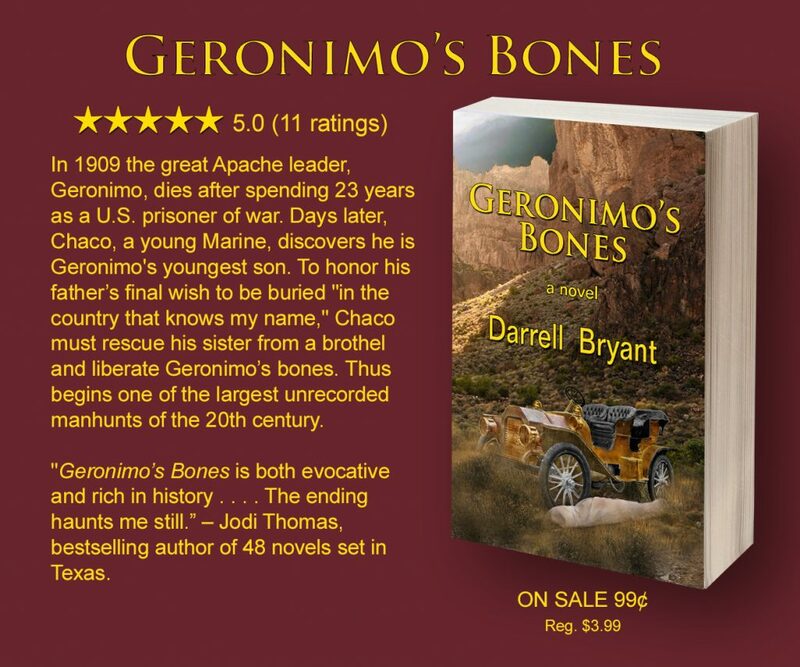 A thought-provoking tale about an Apache’s struggles as well as a rousing romp. 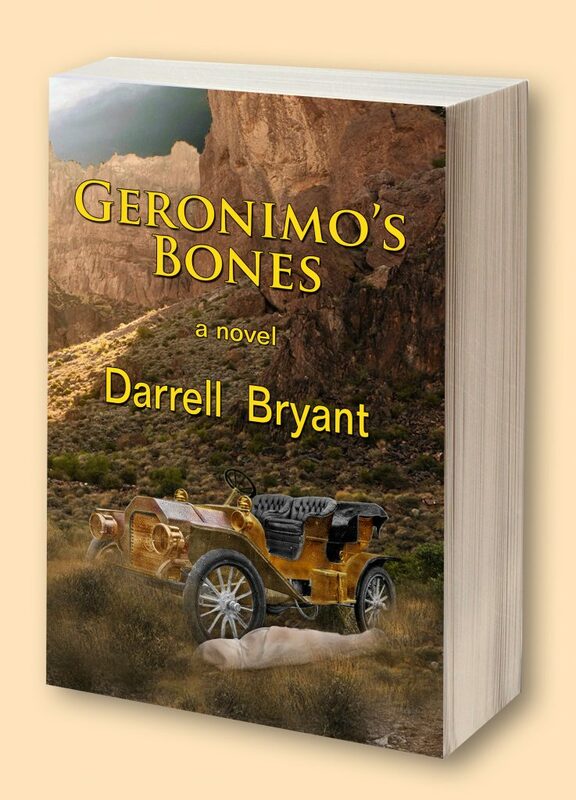 When I began looking for background images to use on the cover for Geronimo’s Bones by Darrell Bryant, my initial search keywords focused on the Superstition Mountains of Arizona. The fifth image I discovered figuratively took my breath away. I immediately emailed the copyright holder and received a reply within an hour, telling me that he had received the email on his cell phone while hiking in the Superstitions on a photo shoot. I obtained a limited-use license and began designing the paperback cover with the single image wrapping around both front and back covers and the spine. 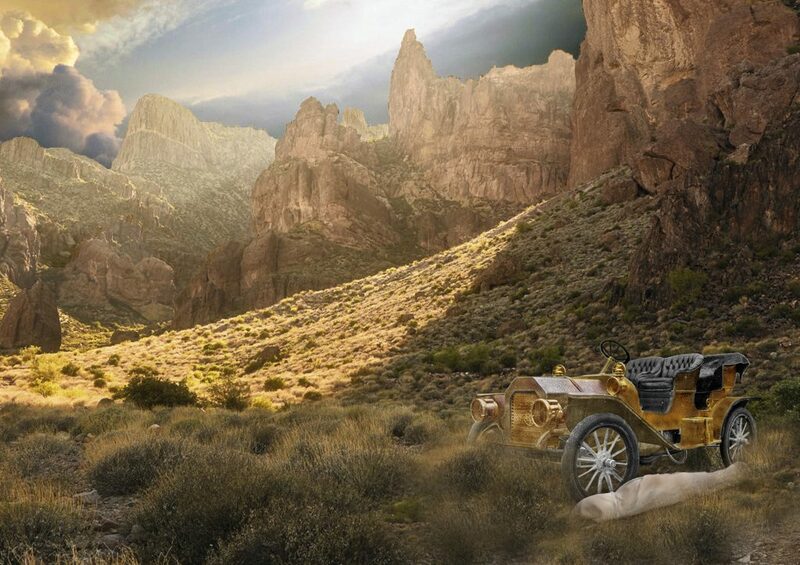 A previous post covers the saga of finding an image to use for the early 20th century automobile I wanted to place on the background, and combining the two required a number of steps to position the automobile in proper perspective to the background and blend it to avoid the appearance of it being pasted in. This usually demands making a decision about which portion of the original photo works best, and especially in this case, it wasn’t easy to crop any of it. And while I really like the final result, the added text, publisher logo, and ISBN box unfortunately distract from the viewer’s ability to fully appreciate the photo, not to mention that it can’t be viewed as a complete image when wrapped 180 degrees around a book. To share with you more of this stunning photograph by Travis Neely, here is the paperback cover with only the two added key elements visible. My latest book design effort has just been published, and as mentioned in a previous post titled “Tosh’s Bookmark Gallery,” I like to offer clients a title-customized bookmark as a standard option. Usefulness of a bookmark can be questioned in a number of ways. Absent the opportunity to attend a continuing series of book fairs and signings, most authors will probably slip very few of them into a signed copy and hand it to a buyer. They’re not easy to carry around like a business card unless you routinely have a briefcase or laptop bag with you. Guys can, however, put a few in a shirt pocket with the top portion visible to be ready for an opportunity to meet someone for the first time and use whatever tactic you’re comfortable with to steer the person’s interest toward your book. One of the common stumbling blocks for many indie-published writers is trying to escape the creative cocoon of their writing desks and come up with effective advertising copy. In my experience, the skill set required to write a novel often doesn’t translate well into writing about what you’ve written. 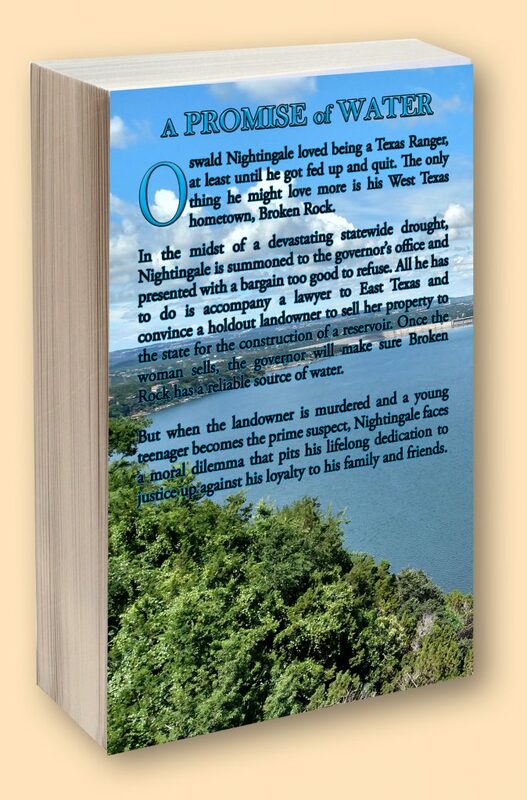 One of the first publication challenges is to write the back cover blurb for the print edition, which is usually the same as the description available online when a shopper is considering purchase of an eBook. On a typical paperback, there’s room on the back cover for only about 230 words to describe the nominal 100,000-word story presented inside the cover. My bookmark designs include the front cover and room for no more than approximately 50 words, less than 22% of that available on the back cover of a novel. Adjusting the typeface and leading (space between the lines) can compensate somewhat, but attempts to cram too many words in too small a space speaks less well than fewer words with more open space around them. 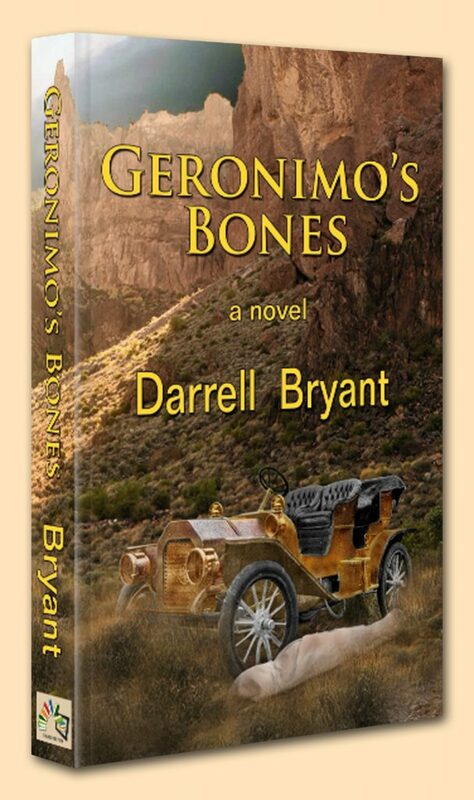 Yesterday I began designing the bookmark for Geronimo’s Bones by Darrell Bryant. That afternoon while exercising on the elliptical, I used the time to ponder ideas I might be able to come up with, and by dinnertime I had text worthy of passing along to the author. We talked this morning, and here is the still-tentative but likely close-to-final result. Creating 3D images of book covers for advertising purposes is a nice touch, and I’ve been using a softcover template with the pages visible in front and rear quarter views. But this morning I came up with a way to create images with a visible spine and the look of a hardcover edition in which the edge between the spine and front and back covers appears to be catching the light source, and the “groove” in the cover fills with a slight shadow. 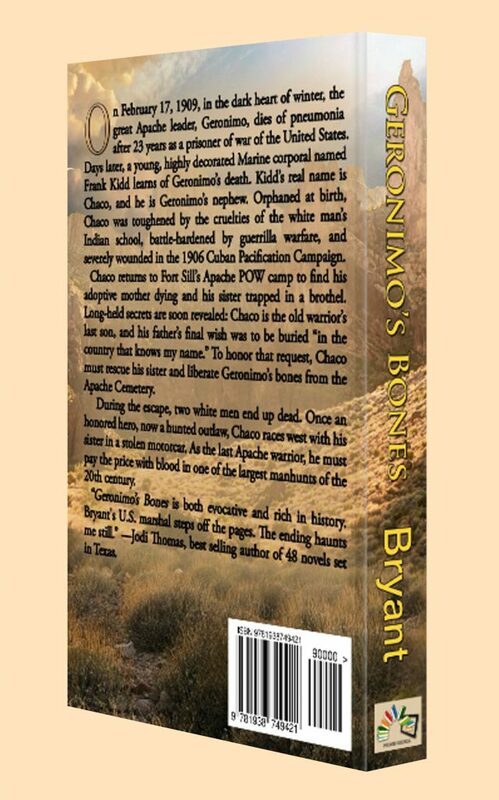 Here are two examples of the technique using the wraparound cover for Geronimo’s Bones by Darrell Bryant. At the end of a previous post subtitled as “Tosh’s Book Cover Gallery,” I noted the titles of three novels currently in work with my interior and cover designs. In Update 1 to the Gallery, I shared 3D versions of the front and back covers of the print edition for one of the three. In Update 2, I repeated that share with another of those novels. This Update 3 is jumping the gun a little, because the novel has not yet been published, but I have sufficient reason of my own to share it prematurely. Like many of my friends and fellow writers in Novel In Progress—Austin, Darrel Bryant has been tirelessly writing for years and dealing with all of the obstacles to getting an agent and a contract with a legacy publisher. To hear him describe the process, he writes novels, sends them to agents, receives rejection letters, archives the latest effort, and begins writing another. A few years back he asked me to read a completed draft of Geronimo’s Bones. I did that and immediately accused him (jokingly) of having hired a ghost writer. In my opinion, it was the finest writing I’d ever seen from him. And that’s saying something, because in my opinion, he’s very, very good at creating stories, from historical fiction set in the Middle Ages to science fiction centuries in the future. Since electing to go Indie in November, 2011, I’ve been waiting patiently for Darrell to finish revising the manuscript so I could nudge him away from the normally barricaded on-ramp to legacy publication and onto the wide-open Indie highway. In late March, 2017, I got an email from him about going that route with Geronimo’s Bones, and it appears that about a year later, we’re getting close. Designing the cover for this novel has been a bumpy ride for a number of reasons, and that description relates directly to the challenge of finding a suitable photo of a touring car from the early 1900s to overlay on a landscape background. I obviously couldn’t use an image of a fully restored car from an antique auto show, but over the course of a few weeks I did come across a magazine article about a group of car buffs who take pride in owning and driving the most original cars they can find. I found a second photo of an unrestored touring car that the owner wanted to sell. I began working with it while trying to contact the seller, again to no avail. My third possibility was for sale on eBay. 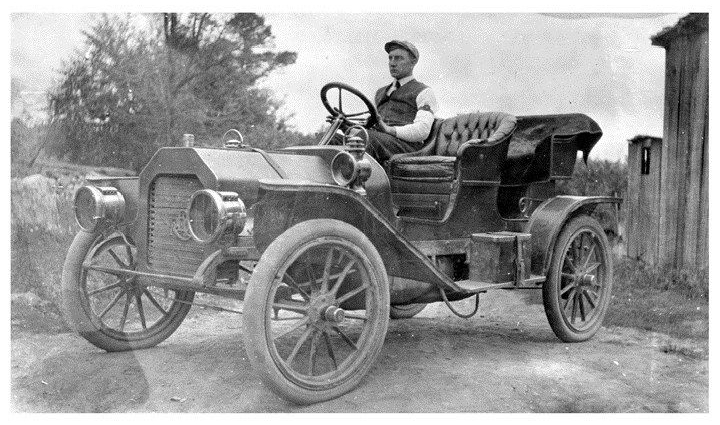 Not the car, but a photo taken in 1908 or ’09 of another REO Lansing. The seller had restored the photo and was offering copies for $11.00 each. Extract the car from the background. Remove the driver, which required that I also remove his seat. Copy the remaining seat to replace the one I removed. Colorize the image, but not so that the car appeared brand new. Position it on top of the background and make it appear to be part of the landscape rather than being pasted on. It took a long time, and the effort included pestering my good friend, fellow writer, and artist John Jones with a continuing series of questions about how to use unfamiliar Photoshop techniques. Being the gentleman that he is, he won’t accept any credit in the book, but I can extend it to him here. At the end of a previous post subtitled as “Tosh’s Book Cover Gallery,” I noted the titles of three novels currently in work with my interior and cover designs. In Update 1 to the Gallery, I shared 3D versions of the front and back covers of the print edition for one of the three, and another of those novels has just been published in digital format on preorder with Amazon. Availability of the print edition will be timed to coincide with launch of the eBook when is is automatically delivered to preorder customers. 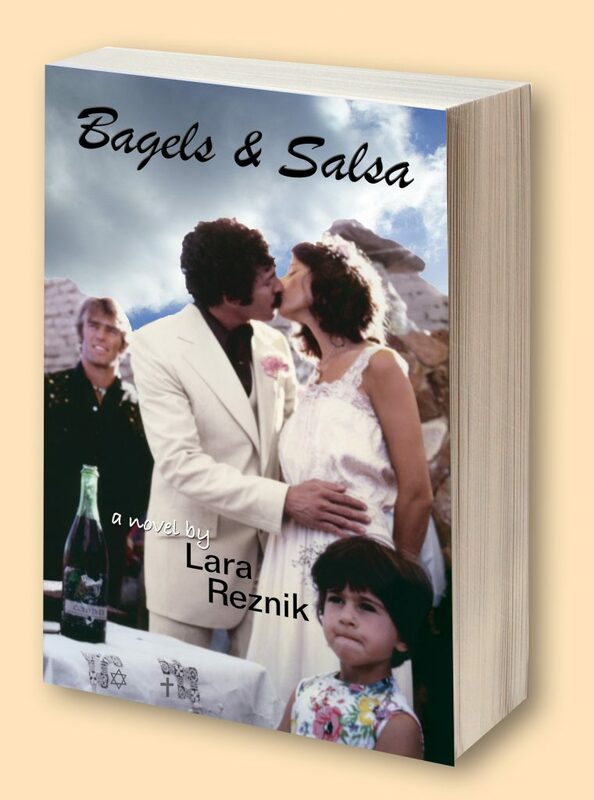 I’ve had the privilege of participating in the Novel-In-Progress—Austin writers’ group with Lara Reznik for over a decade, and her latest novel titled Bagels & Salsa is the third interior I’ve designed for her, but it’s the fourth cover, because Lara published her debut novel the girl from Long Guyland with two different covers. That’s a story worthy of its own post. At the end of a previous post subtitled as “Tosh’s Book Cover Gallery,” I noted the titles of three novels currently in work with my interior and cover designs. One of those is within a few days of publication on Amazon in paperback and digital formats. 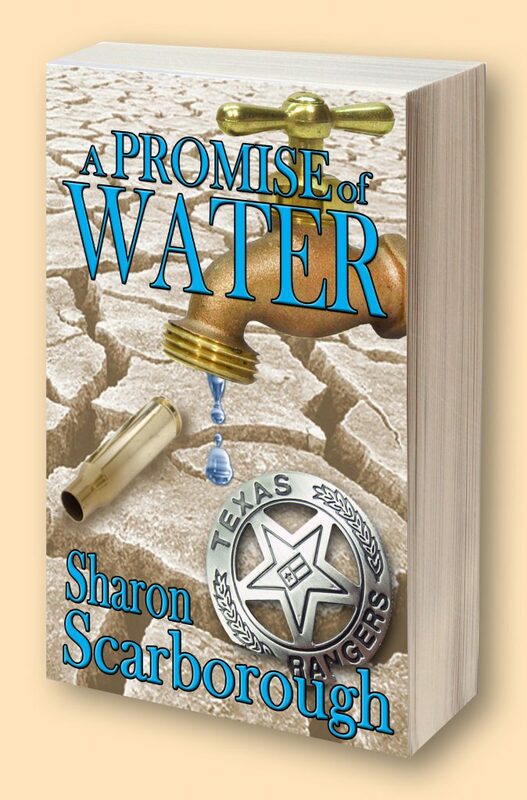 I’ve had the privilege of participating in the Novel-In-Progress—Austin writers’ group with Sharon Scarborough since 2005, and we have supported each other through multiple revisions on multiple manuscripts. 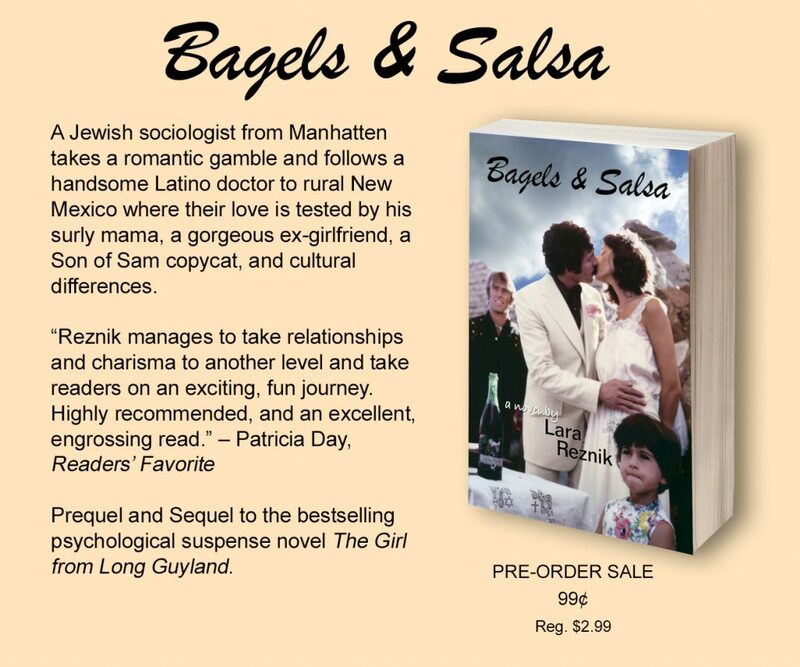 When Sharon asked me to assist with production of her debut novel, I gladly agreed, and we’ve been dealing with all the individual tasks required since late July of this year. Sharon moved from Austin to Murray, KY before we got very far into production, so most of our collaboration has been handled through emails and Skype sessions. I hate to think of how much more labor intensive it would have been using a telephone and snail mail. But we made it, and I’ve often said that holding in my hands for the first time the print edition of someone else’s novel that I’ve helped produce is almost as thrilling as if the book were mine. The explanation, of course, might well be that in a sense, it is. 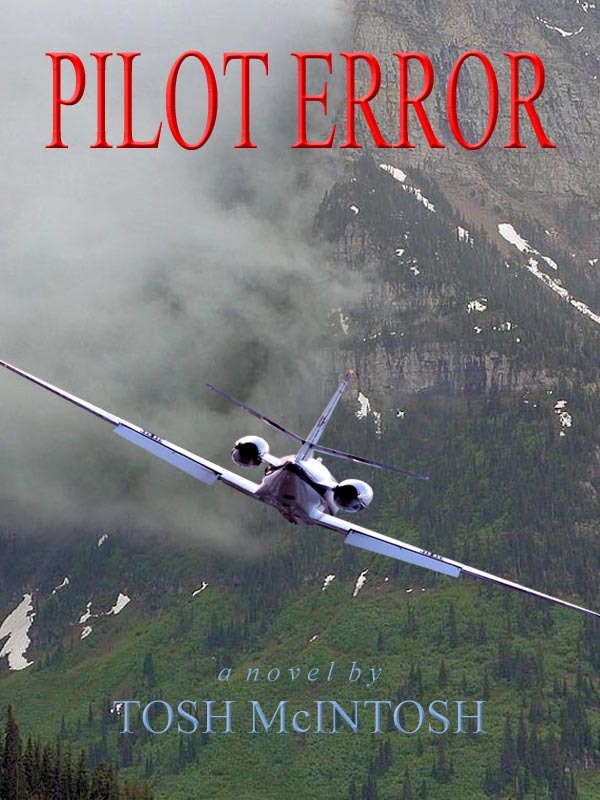 I published my debut novel Pilot Error in 2011 and had Red Line in work when a group of us indie authors attended the 2012 Texas Book Festival and displayed our books in a booth, hoping (in vain) to sell out before the two-day event closed down. Having customized bookmarkers to place in each book after signing it seemed like a good marketing tool, so I downloaded a 2″ x 6″ template and designed a two-sided bookmark with the covers of both novels and the first books of my two non-fiction series on aviating and writing. One of my fellow writers and friends had bookmarks made for the event. She recently asked if I would redo them, which led to designing a bookmark two days ago for another writer and friend who is in the process of launching her debut novel. And so, dear website visitors, the purpose of this post is to share with you the following bookmark designs, and I’ll add new designs to the post as necessary. Special Note: I’d love to claim cover-design credit for Leanna’s novel, but the kudos go to Kristin Bryant of 99designs. My contribution involved resizing the original paperback cover to accommodate the spine width required by the final page count, adding the jacket blurb on the back cover (with a really nice drop cap embellishment), including an excerpt from a Readers’ Choice Five-Star review, and inserting an author photo. Standby for the next addition to Tosh’s Bookmark Gallery . . .